Last year I was dubbed the 'meanest mom in the world'. No kidding! I won that title by making my daughter abide by school rules. Of course "all the other moms let their kids do it!" 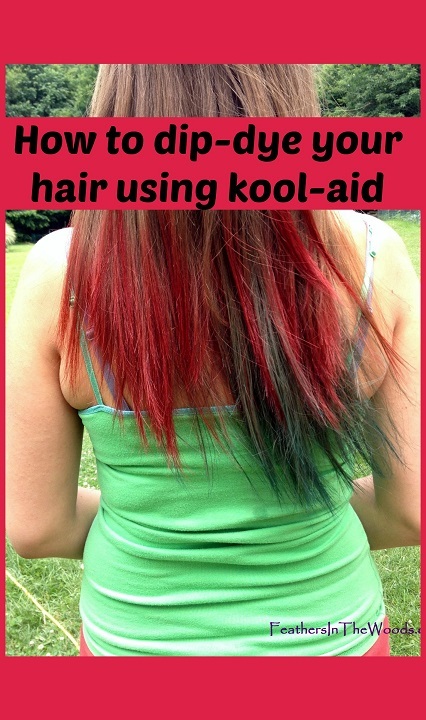 My daughter wanted to dye her hair different colors using Kool-aid and I refused to let her. It was against school policy to have 'unnaturally colored hair' and I was against breaking the rules. So she didn't get to dye her hair even though many of her friends did, and I won my meanest mom title. 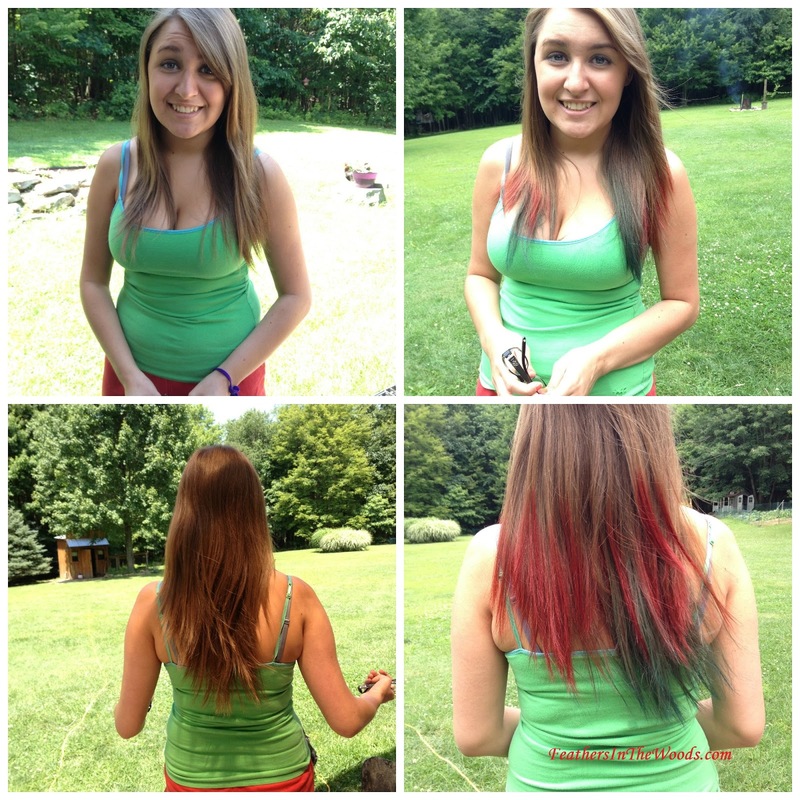 Well, she graduated this year, so not only did I let her dip dye her hair....I did it for her! It was super simple really....all we needed was unsweetened Kool-aid, boiling water, a few bowls and some paper towels. She wanted 2 different colors so first we brushed and separated her clean dry hair. I had her put on an old tank top so she didn't ruin a good shirt. We mixed each packet of Kool-aid with 1 cup of boiling water. Since the blue was a lighter color we put the hair in that one first. We let that sit a few minutes then started the red. I had her leaning against the grill which was approximately the right height. After 5 minutes we checked them both and decided the red was done, but left the blue in for a few more minutes. When each color was dry I pulled the hair out of the mixture and blotted it with paper towels. It will stain a bath towel so unless you have a towel that you don't mind ruining, paper is the way to go. Speaking of stains, we used heavy glass bowls to make sure they didn't tip over and spill the mixture...as she was leaning right next to them. Kool-aid may stain if it gets on clothing and it could ruin certain finishes. Related reading: this post on Using Kool Aid to clean your toilet! 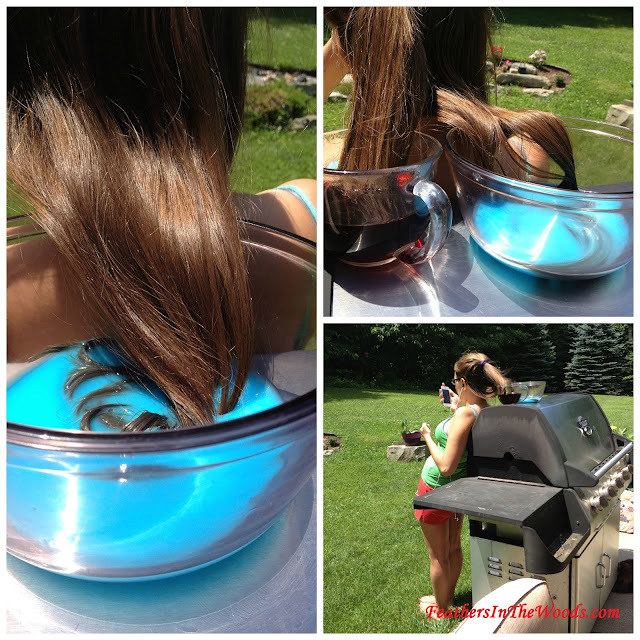 After blotting the freshly colored hair dry, my daughter let it air dry then brushed her hair gently to smooth it out. That was it. She was so over-the-moon happy about it! It's been 3 weeks now and it's still red on the ends though the blue is starting to fade. We noticed the biggest amount of fading after she went swimming in a pool. I'm sure a lake or pond wouldn't be as bad since there is no chlorine content. It doesn't seem to leak color much anymore though for the first few days I would recommend using a dark towel to dry hair after showering. It was the big fad last year so while it's not the newest trend or anything like that...it still has several really good points. 3) at $.13 a packet it is super cheap as far as hair dye goes! It's a fun technique and even though it took a year for me allow her to do it, she is super excited about her new look! Since you already have the Kool-aid out, head over and find out How to Dye Feathers with it! That's a lot safer than using real dyes and it looks great! I must know, did you get your fun Mom title back? I have always wondered how to do this. Thanks!